Interview with Andrea Williams of Paper Paisley Co.
Browsing Paper Paisley Co., you are immediately drawn in by colors that pop and whimsical fonts. And quickly, you can't help but smile, nod, and even laugh out loud when you actually absorb each message. 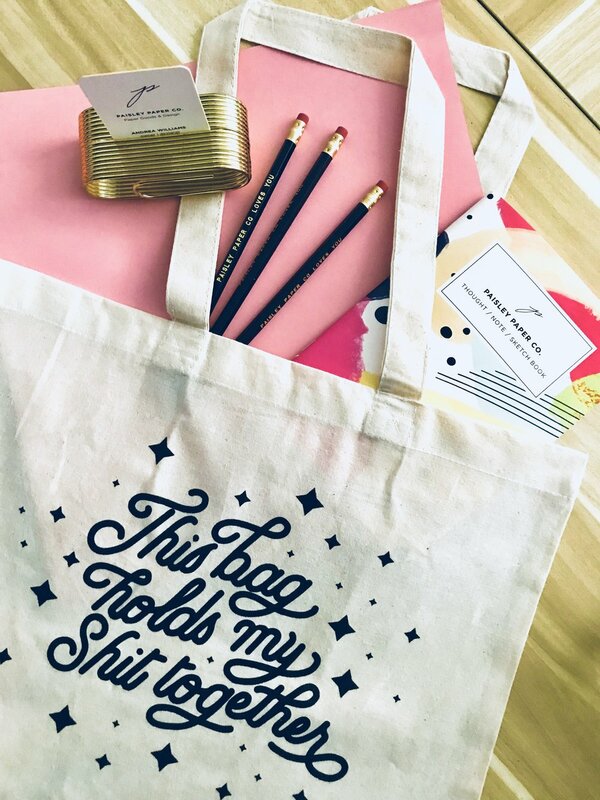 Andrea Williams, the creator of PPC, produces playful, candid, and spirited one-liners on stationary, totes, journals, shirts, and prints. I was able to talk to her more about her work as a designer, starting her own business, and Detroit, the city she calls home! When did you start Paper Paisley Co.? What inspired you to do so, and what was the process like from first coming up with the idea to executing your vision? Paisley Paper Co. started from an Instagram post, oddly enough. I took a quick snapshot of my handwriting, and I began getting questions about doing calligraphy. I’d done some calligraphy in middle school and high school…but never really took it seriously. I bought a kit and started practicing calligraphy for hours and hours a day. Then friends asked me to make cards for them. And it kind of snowballed from there. It’s been a great ride so far, and I’m looking forward to what’s next! My process is “keep drawing it until it looks better”…so however long that takes…is just how long it takes. I don’t rush the process. What is it like running your own business? Any advice for other women entrepreneurs?! It feels empowering, overwhelming, exhausting, exhilarating, difficult, crazy…all at the same time. If I had any advice, I’d say that you should know your limits. Learning your limits will always be a work in progress. Delegate and practice useful self-care. How did you first discover your love for illustration and design? I couldn’t have been older than 3 or 4. I’ve always had a natural instinct about color and design. I ended up going into commercial design in high school and then got my BFA in graphic design. (In addition to Paisley Paper Co.), I currently work as a senior art director at an advertising agency in Detroit. Whether it’s digital design, hand-lettering/calligraphy or illustration, if my skill set isn’t quite capable of getting the desired look…I usually at least know what it SHOULD look like. And I don’t stop until I get the desired look. That’s honestly the thing that pushes me the most. What is one of your favorite pieces you've created and why? My favorite card or illustration changes every time I do something new. I’d probably say my valentine’s card with the lips is in the top for me right now. How long have you lived and worked in Detroit? It’s no secret that it’s one of the poorest big cities in the country and has gone through real trauma in the past decades with urban decay, riots, water crisis, bankruptcy, institutionalized racism, unemployment, and more. Can you describe the city and the climate there for someone who has never been? Are there a lot of folks still struggling and evidence of the hardship both the city and its people have gone through visible in the day to day? What do you want people to understand about Detroit and what the city has been through and has to offer? This is such a loaded question. I’m Detroit born and raised. I think the first part of this question represents a long-standing narrative that despite the great things happening here…we just can’t seem to shake. You can find all that trauma in just about every other major city…and yet those cities aren’t usually defined by it. As an artist, I think that’s the driving force behind why I stayed here, built my business here and continue to grow as an artist here. Detroit is like any other major city. There are many people living here that struggle. We have areas that aren’t the best. We have government bureaucracy that impacts minorities and the marginalized more than others. But Detroit also has a vibrant arts and music community. We have Detroit-born folks here that are changing not only the vibe of the city, but representing Detroit on a national and global stage. I think about my experience and my friends who are medical professionals, attorneys, radio personalities, muralists, photographers, entrepreneurs, IT professionals, advertising executives, teachers, non-profit organizers…you name it. Almost everyone I know has a career that they are passionate about…and some other business/blog/cause that they are equally passionate about. Each one of those businesses/blogs brings positive change in the city. The natives here work hard to improve the lives of others and the city in general. Why wouldn’t you want to be a part of a place that has so many people working towards making it the best it can be? What is the creative community like in Detroit? What are some of your favorite places there? Museums, shops, restaurants, sites? So many places. The Peacock Room and YAMA - both boutiques are great for shopping for those one of a kind dresses or pieces. Bob’s Classic Kicks is another favorite of mine. It’s a great place to get sneakers and fashions from local designers. About a mile or so away is The Detroit Institute of Arts. This museum is one of those places that you kinda take for granted. And then you go and you’re just amazed at the vast collections of work that’s on display. I just went to North End Studios – a gallery space located in one of the neighborhoods on the west side of the city. For eats, I love The Block in Midtown Detroit. I must mention Belle Isle…it’s an island on the east of Detroit. It’s a summertime staple because it has a nice beach, newly restored aquarium and observatory. Who are three women you look up to or that inspire you creatively and otherwise in your life? This is a tough one for me. I have so many wonderful women in my life. Artistically, I would say Andrea Pippins. She’s a super talented illustrator and designer. I’ve been following her career for about 5-6 years now. She amazes me every time. Another artistic inspiration for me would be Sydney James. Detroit born and raised artist and muralist. Her work can be seen literally all over the world. Since I know her personally, I see how hard she works and how much she pushes herself creatively. Lastly, Jacqueline M. Baker. She’s a very good friend of mine. We are in completely different worlds. She’s an entrepreneur: etiquette and leadership trainer. What I admire about her the most is that she just goes for it. She doesn’t wait until the right time…she makes it right with the time that she has. She actually helped me name Paisley Paper Co.
Can you tell us more about this image you recently created? How do you infuse your political life with art and/or vice versa? Do you think it's important to do so? After the Parkland shooting, I woke up with this image in my head. I kept wondering: how can we continue to be complacent with this issue? How many more people need to die? Outside of this piece…and maybe one other piece years ago…I don’t usually infuse my political life with my art. It’s something that I hope to do more of in the future because I do think it’s important. Different political beliefs can tear friends and families apart. I think maybe art can bridge that gap and make it more digestible for the opposing viewpoint. Feminism means women of all races/abilities/sexual orientations fighting for the advancement of all women. Intersectionality is key. There are issues that are particular to certain races of women. Imagine how powerful the resistance would be if ALL voices were denouncing those issues.